Mount Rainier National Park is a magnificant snow-capped, dormant volcano with a hight of 14,410 feet, is located southeast of the Puget Sound and is the highest place in Washington State. Mt. 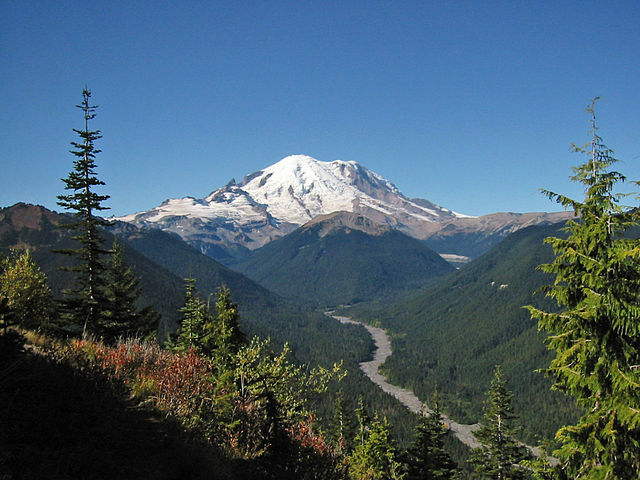 Rainier is also the higest contigious peak in the United States with 25 named glaciers. Longmire (elevation 2,761 ft.) is the park’s oldest developed area, located just inside the southwest Nisqually entrance. Longmire’s small museum highlights the mountain’s history, geology and ecology. Food, gifts and lodging at the National Park Inn are available year-round. Backpackers can obtain a wilderness permit at the Longmire Wilderness Information Center. Cougar Rock Campground is located two miles north of Longmire on the road to Paradise. Paradise(5,400 ft.) is the primary destination for many visitors because of its spectacular view of the mountain, summer alpine meadows of wildflowers and deep winter snow ideal for cross-country skiing and snowshoeing. While Paradise Inn is currently closed for renovation, the day visitor center is open during summer, offering informational exhibits, food and gifts. Climbing guide services are also available. Ohanapecosh (1,900 ft.) is located near the southeast Stevens Canyon entrance to the park, surrounded by old-growth Douglas fir forests. Nearby is the amazing Grove of the Patriarchs. A visitor center and campground are open here from May through September. The Carbon River entrance (1,880 ft.), on the northwest side of the park, leads to a pristine area with the most luxuriant forests and greatest rainfall. Mowich Lake (4,929 ft.), accessible by an unpaved road, offers scenic views, access to popular hiking trails and a walk-in only campground. From late May to mid-October the National Park Service staffs a ranger station located in the town of Wilkeson. The White River entrance (3,500 ft.) on the east side of the mountain is reached via State Highway410, a National Scenic Byway. This entrance has a wilderness information center that issues permits for backpacking and climbing; between it and Sunrise are many trailheads, spectacular vistas and a large campground. Sunrise (6,400 ft.) is the highest point in the park reachable by road. Its location in the rain shadow of Mount Rainier makes it much drier than Paradise. Visitors enjoy wildflowers, panoramic views and a day visitor center with food services in summer months. Mount Rainier National Park offers hikes for every level of fitness. You can stroll easy, paved paths near the Paradise Inn and venture uphill a bit further to view waterfalls. You can hike dirt trails through wildflower meadows and steeper alpine terrain. And you can do more strenuous day hikes from many trailheads around the mountain. Really ambitious? 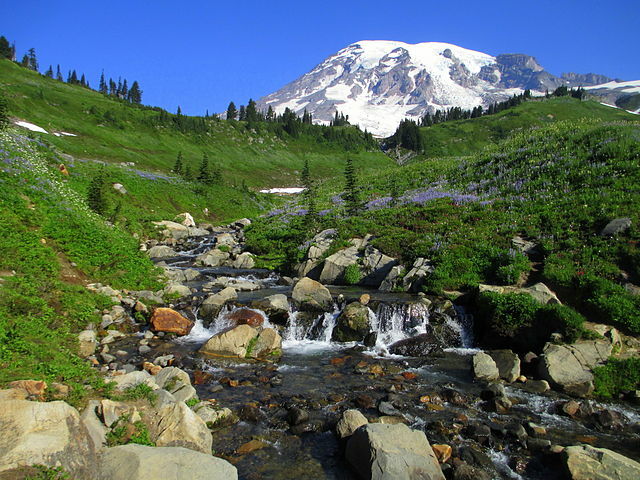 Consider hiking the 95-mile Wonderland Trail that encircles Mount Rainier! Also, the Mt. 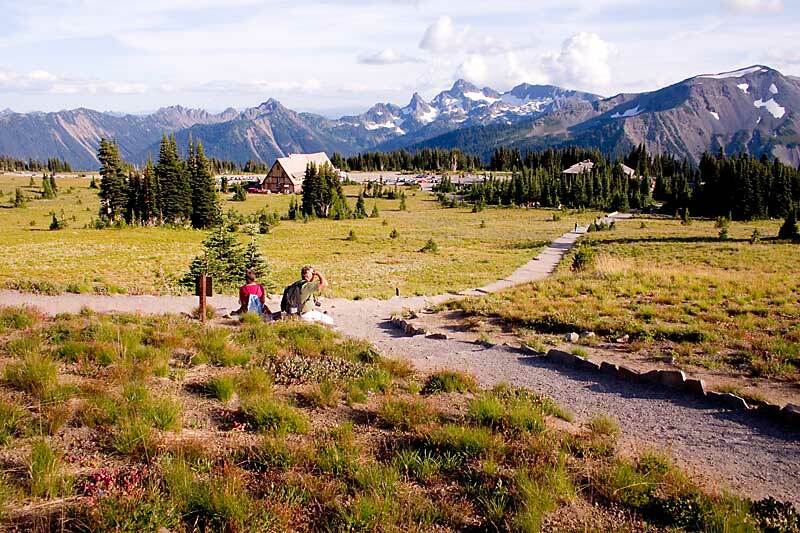 Tahoma Trails Association, based in Ashford, maintains two extensive trail systems to the west and south of Mount Rainier National Park. Along the trails are overnight huts for serious backpackers and cross-country skiers. Mount Rainier may look like a big benign scoop of ice cream – but it can be a dangerous mountain for those who seek to climb it. Unless you’re a serious climber with extensive experience, go with one of the expert guide services that specialize in summit climbs. They can arrange climbing permits, rent gear and provide training/safety sessions – and lead to you an exhilarating mountaineering experience!